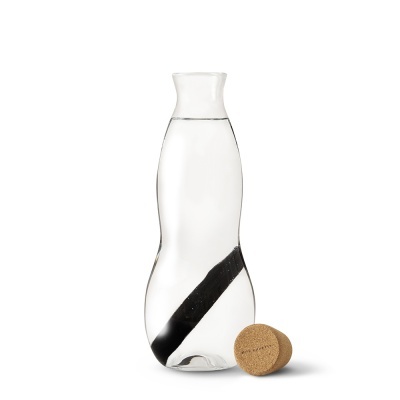 Glass Water Jug with Charcoal Water Filter, hand-blown glass by master craftsmen in Poland and natural cork sourced in Portugal. The charcoal water filter is already activated. Purifying your water with charcoal is an old Japanese tradition, it is sustainably sourced from natural harvested wood in a kiln. An elegant, hand-blown glass water jug with a charcoal water filter. The combination of hand-blown glass by master craftsmen in Poland and natural cork sourced in Portugal produces this elegant carafe. 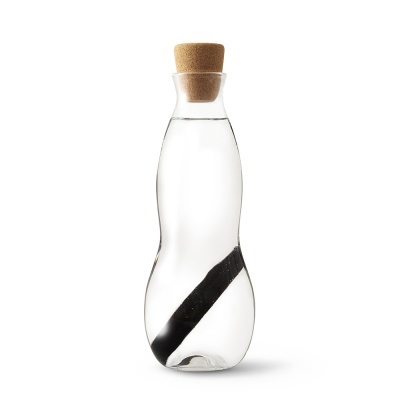 The shape of the filter glass bottle has an organic feminine form that magnifies the beauty of the water it holds and makes it comfortable to hold and pour from. This glass water jug (carafe) has the perfect width and length designed to fit in fridge doors. The activated charcoal water filter attracts the ions of tap water contaminants to the surface of the carbon, to be held and at the same time releases minerals such as calcium, iron and magnesium back into the water. Purifying your water with charcoal is an old Japanese tradition, it is sustainably sourced from natural harvested wood in a kiln. Your binchotan charcoal is already washed and ready to use. 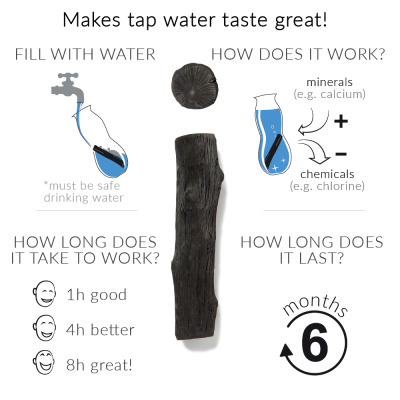 The active charcoal filter has 6 months of life and will make your tap water taste great! This charcoal water filter comes already activated, so no need to boil at first use. After 3 months of use, you should recharge it by boiling it in water for ten minutes and then leaving to dry in sunlight. The natural water filter can be composted at the end of its life, it will add nutrients to the soil that will help the plant to grow. Refills are available here. The stopper is made of renewable Cork. One single natural cork alone binds eight grams of the greenhouse gas CO2. In addition, cork helps to preserve one of the most biologically diverse habitats in Portugal. Ideal for water, please do not use with flavoured cordials, fruit infusions or tea. Includes x1 binchotan active charcoal filter (6 months life). Packaging - Cardboard Box. As the charcoal is already cleaned and activated it is packed in an airtight seal which is plastic. The rest of the packaging is plastic-free. Please remove the binchotan from the bottle before washing with soap. Please make sure your bottle is filled when placing your charcoal to avoid any breakages. Occasionally you will notice tiny particles/fragments of the charcoal in the water, but do not be alarmed as it will do you no harm if you swallow them (active charcoal tablets are prescribed to treat diarrhoea, digestion and flatulence). The glass bottle is dishwasher safe, but the cork top is not. Make sure you do not leave water sitting in your bottle when you are not using it (for more than one day). Remove the stopper and allow it dry out. When water is left in the bottle for long periods of time, mould spores can form. The binchotan charcoal removes the chlorine from drinking water, so you might notice it forming even quicker than normal. This is nothing to worry about, as long as you refilling regularly, cleaning the bottle regularly and not drinking stale water that has been sitting in the bottle for more than a day. We recommend using lemon juice, followed by boiling water, to kill and wash away mould that has formed on the cork.